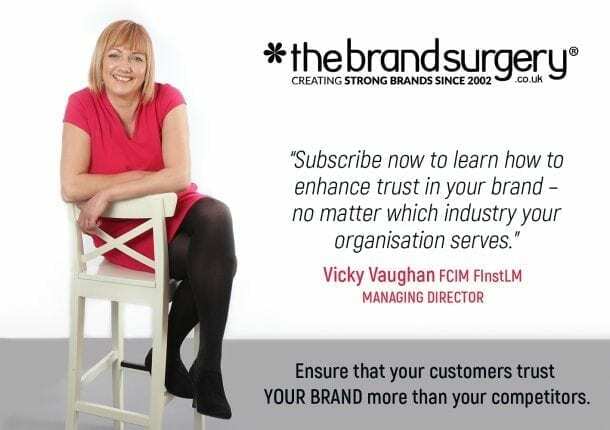 Vicky from The Brand Surgery® came highly recommended by one of our local authority customers, so we knew that she not only understood marketing but she understood our audience too. Vicky audited our core marketing activities which has highlighted that we didn’t promote our CSR or our skills to their full potential. She also suggested some great ways to improve the impact of our communication by segmenting our target audience which will greatly improve our communication to potential customers. We are looking forward to further marketing consultations with The Brand Surgery® and highly recommend the team. We have been working with iESE since 2010 providing a blend of creative design and strategic marketing consultancy. iESE is a public sector transformation consultancy and it’s objective is to increase its footprint within the public sector. You may or may not know that our MD, Victoria Vaughan has fourteen years of public sector experience, both at officer and member level which means she understands the challenges and demands of local government. This experience blended with her coaching expertise, has enabled iESE to repackage and promote its portfolio of products, in a language that suits both officers and members. iESE has achieved many firsts in public sector transformation; one of the most important is shared services and Adur and Worthing Councils were one of the first to share a Chief Executive and Senior Management team. The Councils share refuse, recycling, planning and many more services however, they keep separate identities where possible. 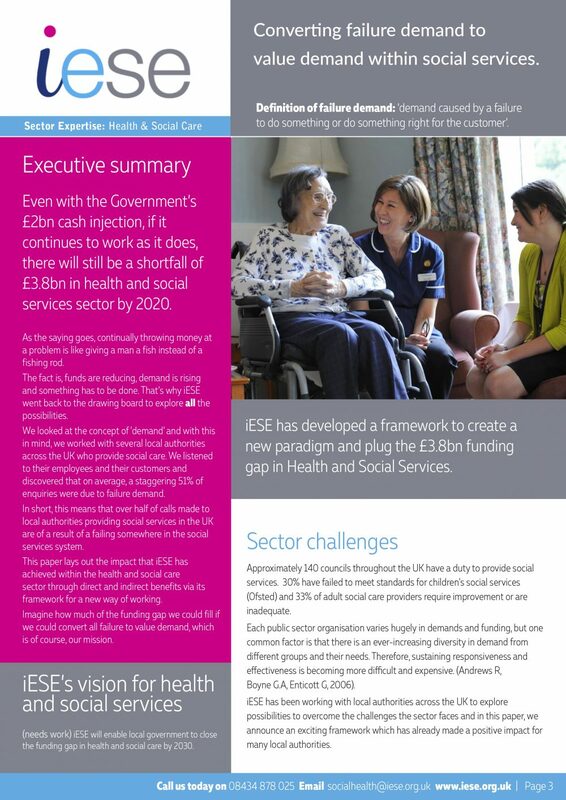 Of course Shared Services between two or more councils is standard these days and therefore iESE is busy developing new, innovative ways for councils to become self-sufficient. With this in mind, The Brand Surgery has been commissioned to promote these new ideas by writing the white papers and case studies. See details below. iESE is excellent at transforming the public sector, however, like many organisations, the leaders are wrapped up within their business which is a barrier to marketing. This is why it is good practice to outsource marketing strategies to a FCIM Chartered Marketer, who add a different perspective and are more likely spot blind spots and limiting assumptions. We developed a marketing strategy and marketing plan including a strategy implementation calendar. The strategy provided a customer segmentation analysis which showed how diverse councillors and officers are; they all have different KPIs and personal agendas. Our fourteen years of public sector experience is really helpful in creating segmentation profiles for successful marketing and promotions. This project has focused on Nationwide Building Society’s call centres; iESE has been coaching call centre agents to continually improve customer service. This is iESE’s first step into applying its innovative tools in the private sector. To create the perfect case study, we combine extensive market research and also interview key personnel which enable us to add more depth. There is always a trade-off between promoting impressive statistics versus sensitive information and The Brand Surgery team are experts in presenting information in a transparent manner. While researching for this Call Centre case study project, we researched a concept called Failure Demand which can be applied to all sorts of organisations. “Failure Demand, as a concept, provides great insight in the inability of the Customer experience (design) to provide for a Customer’s desired outcome(s).” (Wim Rampen W, 2009). In other words, if products and services were designed more effectively, customers would only call for positive reasons resulting in the perfect brand. For this case style study, we were provided with rough outline text and bullet points and we created the case study from this. The objective is to promote iESE’s 3R model and demonstrate how it can help councils to become self-sufficient. Aylesbury Vale District Council’s Planning Department has benefited from iESE’s work; the Planning officers are now more commercially aware and prepared. This means that when Planning is deregulated, the Council will be able to maintain, if not increase, the surplus level they currently have in spite of any competition they may face. Do you need a case study for your organisation? Contact us today. iESE has in-house creative expertise but occasionally, when the team is stretched, we provide graphic design services. Generally we are provided with a brief to which we deliver stunning results. The banner on the left is an example of a recent design where we followed the brand guidelines yet still add something different. Please contact us if you would to strengthen your brand to the very best it can be. We will make it flexible and future proof it so it is ready to face anything, however unexpected. Contact us today if you would like to commission a different colour way of the above illustrations, or would like a different illustration in this style.